Cimbali has enriched its range of traditional espresso and cappuccino coffee machines with the presentation of the M24 series, produced both in the dosed version (Plus) and in the continuous one (Premium), both available in 2 and 3 group. M24 has a sleek and refined modern look, enhanced by the stainless steel and black varnished body parts and by the carefully designed push button panels. Thanks to the thermal balanced groups, M24 is able to assure a high in-the-cup quality with every coffee blend and in any working conditions. Simple to use and characterised by high performance, M24 features a stainless steel hot water wand and two multi-directional stainless steel steam wands, ergonomic steam delivery control taps with reduced rotation and tilted filter-holder handles for easier use. Both the dosed and continuous versions have push button panels with immediate and precise electromechanical buttons, and in the PLUS versions the chosen selection is signalled by a LED. 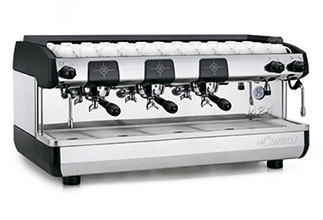 The PLUS also has a microprocessor thanks to which the operator can programme and modify the coffee doses easily.